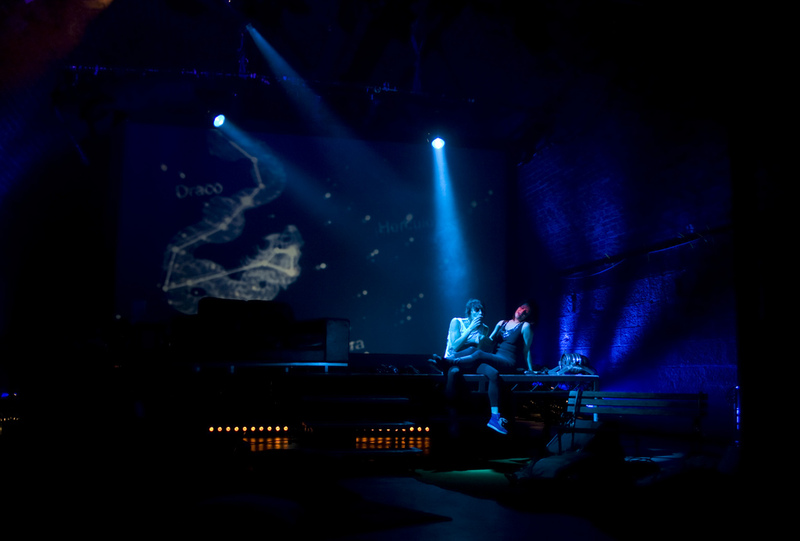 In 2012 I spent one of the most exciting weeks of my life at the Arches, performing in Whatever Gets You Through The Night, a genre-straddling live show that brought together the work of over 20 brilliant Scottish musicians and writers. It was, for lots of us involved in that big, ambitious project, the culmination of years of formative experiences at the Arches. After discovering today that it really is closing down, I find myself missing the place with an ache that feels like grief. Whatever Gets You Through The Night was revived the following year for the Edinburgh Fringe, but for me it never had the same resonance there as it did at the Arches. It was, in some ways, the quintessential Arches project, shaped by the culture of the organisation right from the beginning. It happened in the first place because the Arches invited Cora Bissett to make whatever sort of show she wanted – an act of trust in an artist who had a long association with the venue. My first two encounters with Cora, years before, were both at the Arches – in a brilliant stage version of Under Milk Wood (punctuated, as all Arches shows were, by the rumble of trains overhead) and at an album launch by her band Swelling Meg. It was thanks to the Arches that Cora established herself as a theatre director, with Amada, after winning the Arches Award for Stage Directors. It got rave reviews and a CATS award, and paved the way for Roadkill, which won every award going. After that she made Glasgow Girls and Grit – and all this brilliant work can be traced back to that Arches award in 2007. Cora wanted to make a show that brought together indie musicians and theatre-makers. That, in itself, was a very Arches thing to do, but we ended up going much further. As soon as you walk into a place where money from hedonistic, hugely popular club nights is used to fund radical, often challenging theatre and live art, you feel as if the usual cultural boundaries and rules don’t apply, and you can’t help but act accordingly. In the end, rather than throwing together two different cultural worlds, we threw together pretty much as many as we could think of – club culture, theatre, live art, dance, poetry, cabaret, music (from folk to rock and electronica, and including RM Hubbert, Ricky Ross, Withered Hand and Emma Pollock, all pictured above), sketch comedy, cinema, circus, even a bit of panto spirit. And why wouldn’t we? This was the Arches, after all, a place where all those art forms seemed to co-exist quite comfortably. Over the years I’ve been going to the Arches I’ve seen a Dante’s Inferno that used the entire building including all the backstage areas downstairs, an auto-destructive art performance by Gustav Meztger, a New York drag queen with a ukulele, a feral choir, a production of Oscar Wilde’s The Selfish Giant, and a pretty amazing gig by Hot Chip. None of these felt like an atypical Arches experience. I’m not sure there is such a thing. Many of the people I ended up working with on Whatever Gets You Through The Night came to my attention via the Arches. My first encounter with David Greig was at the Arches, with the early Suspect Culture shows Europe and Mainstream, which I loved. I met Kieran Hurley at the Arches, when he was making Beats, a theatre show about clubbing – another very Arches project. I discovered Drew Wright, aka Wounded Knee, via an experimental music scene whose most important gathering place was the annual Instal festival at the Arches. 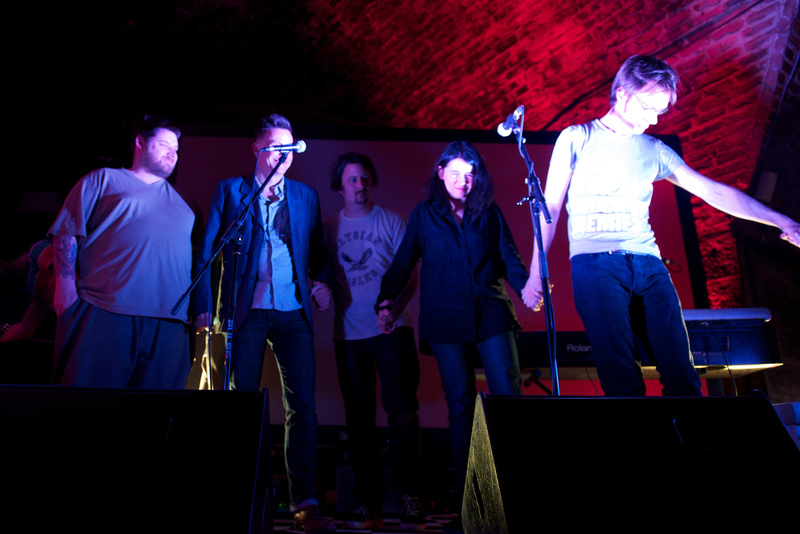 The first time I performed at the Arches was in 2006, when my band Swimmer One worked on an experimental show that, in retrospect, felt like one of numerous prototypes for Whatever Gets You Through The Night. Called We Just Make Music For Ourselves, it was an hour-long battle for attention between a theatre collective – Highway Diner, our collaborators – and two musicians. Songs were sung, paper was eaten, speeches were made, a tent was erected. The show was part of Arches Live, a festival that has continued to be fantastic place for all kinds of performers to take all kinds of risks. I’ve appeared in it twice since, making small-scale pieces with my wife Laura, who I met through Highway Diner. The first time we did it, we put in a slightly vague proposal about imagining a sort of cosmic dating agency, which was enthusiastically accepted. By the time the festival opened it had become something entirely different – an installation that used stones, fishing line, and two recorded monologues to tell a story about grief and loss. Throughout this whole process The Arches were quite happy to let us take the piece in whatever direction we wanted, and never questioned why we were asking for an increasingly random-seeming set of objects from its prop store. Parallel Lines, as it ended up being called, went on to be staged at Summerhall, in its first year as an Edinburgh Fringe venue, at IETM, and at a festival in Italy called Different Sensations, and had a warm response wherever it went, some people spending hours inside it. None of that would have happened without that initial act of trust. Loads of other artists, most of them far better known than me, will tell you similar stories. While working on our installation I remember stumbling – slightly to my surprise – across a rehearsal full of naked women in the next arch. This turned out to be the first incarnation of Nic Green’s Trilogy, which went on to the Edinburgh Fringe and Battersea Arts Centre, with ecstatic reviews at every stage. Another person we met at the Arches was Julia Taudevin, then finding her feet as a director, now a rising star on the back of shows like Chalk Farm, Rantin’ and Some Other Mother. The Arches had its problems, of course. Crucial bits of technical equipment had a habit of disappearing from your delicate art installation and turning up next to a set of DJ decks somewhere else in the building. The final performance of Whatever Gets You Through The Night was almost ruined, thanks to a spectacularly ill thought out piece of scheduling, by a rowdy party in the arch next door. Things could be a bit chaotic sometimes. These are the hazards of trying to operate a venue in the way the Arches did. But there is a reason why so many artists are so angry, so heartbroken, about the stupid, shortsighted, scandalous, unnecessary and wholly avoidable act of cultural vandalism that finally killed the place off earlier today. And it is this – the Arches trusted people, it took risks on people, it supported people, it took a long, broad, always hopeful view of what people might be capable of, and British culture is richer, in all kinds of ways, as a result. And this is precisely the opposite of what the police and Glasgow City Council have just done. Those responsible for closing the Arches have judged, presumed the worst, pushed good people into a corner, disregarded the bigger picture and the longer view, and destroyed something precious, with a philistinism and carelessness that is staggering and shameful. An awful lot of people, artists and audiences who have had life-changing experiences in that building, will never forgive them for it.